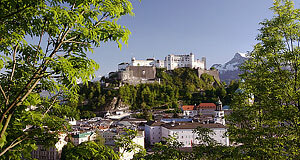 The Festungsmuseum is a little museum inside the Festung Hohensalzburg (Castle or Fortress of Salzburg). Except for special guided tours, the museum is not accessible without visiting the castle - the Festungsmuseum is seen as part of your "castle experience". Since the castle is among the very top-attractions of Salzburg, guided tours are often fully booked weeks in advance during the summer season; entering as an ordinary visitor, however, is no problem. The Festungsmuseum was renovated and modernised until 2002. The objective of the exhibition is to show the history and the development of the castle, the biggest fortress of Central Europe. A few things pre-date the erection of the first castle in 1077 - these items include Roman artefacts that illustrate original buildings on the Festungsberg and Nonnberg. Later items in the exhibition show how the construction of the Fortress progressed, primarily from the 11th to the 16th century and how it was incorporated into the general fortification of Salzburg in the 17th century. Some sections in the Festungsmuseum are dedicated to single events in the history of the castle or significant individuals, such as the siege of 1526 or the legendary Prince Archbishop Leonhard von Keutschach (1495 to 1519), who shaped the current appearance of the castle. Other aspects of the exhibitions include the obligatory stuff that one can expect in any respectable castle museum and that will make kids rejoice: Arms, instruments for torture, cannons and costumes. Since the modernisation that was mentioned above, the exhibition is lively, interesting and presented in a state-of-the-art manner.